As editors, Vassilakis and Crag Hill have created a forum where the works included are able to perform this work of mutation on each other. If “all poetry is fragment,” as McHugh proposes, the Vispo Anthology suggests that all fragment is poetry, whether the fragment be written or visual. In some of the work, such as Oded Ezer’s “The Message,” letters quite literally lift from the page and become three dimensional. Others, such as Reid Wood’s “Bab(b)el-On” and Irving Weiss’s “Turret of Babble,” suggest that the accretion of characters has the ability to obscure or even negate their meaning. Some pieces, such as Holly Crawford’s “Duchamp Without the Words,” take letters out of the equation all together. The Vispo Anthology suggests that our symbols, be they letters or depictions, gain new force in juxtaposition. The result is works such as “As Bad As Making Someone Give Up A Decided Suicide,” in which Suzan Sari gives symbolic clues that defy simple definition or narrative: there is Y repeated in different typefaces, what might be a melted revolver, perhaps a window curtain cord, and what is definitely two lavatory symbols practicing the Kama Sutra. Is this a poem? The parasol-wielding women falling backwards off a U in J. M. Calleja’s “Dizziness”—is she a poem? What of the geometrically apportioned city park, its green spaces punctuated with benches and trees, in Fernando Aguilar’s “Ecological Sonnet”? 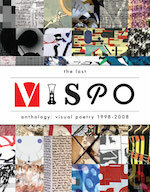 Perhaps the greatest feat of the Vispo Anthology is its expansion of the discussion of how we define poetry. In his introduction, Vassilakis writes that one of the goals of the anthology is to inform “the young fidgeter of letter construction” that “Vispo is viable poetic form.” In this goal, the anthology is a definite and exciting success. Action too is mediated. Events take place not in a scene, but in how a scene is seen, as in a “—zip pan / over the plane trees”. (25) The most potent metaphors unspool from technologies of reproduction of one sort or at other, illuminated “by this rakish / twilight, its Xeroxed / veneer”. (27) Like the work of Robert Irwin or James Turrell, “first light” is “Deskjet scarlet & halogen / white”. 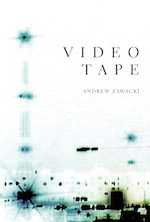 (30) And although these artists are not among the many image-makers the book takes note of, they are a useful point of reference, since language, the material of Videotape—like light, the material of those artists—changes the world by apprehension. And since no reproduction is perfect, the world of these poems is defined not just by the imperfection of memory, but by what it adds to an image. Its errors propagate to become a part of remembered events: a “world / that is not / world enough & is / not not / a world”. (32) It is the world as re-made in some future consciousness, a version of Keats’ urn or Yeats’ gold-hammered bird. Not only sight, but also sound is mediated: “waves breaking in lullaby from a mobile set to ‘nature’”. (40) And in that same section, moving across the globe with inhuman speed, the speed of thought outpaces us from Montparnasse to the Niger, always via the subnuclear pulse of metaphor.